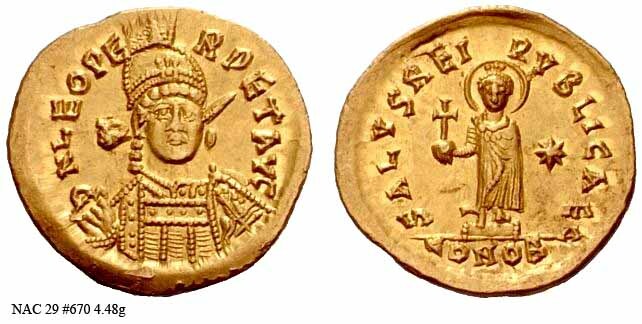 474 Leo II was the child grandson of Leo by the marriage of his daughter Ariadne and his favorite general Tarasicodissa (later Zeno). When Leo I died, Leo II was still only five or six years old and thus a regent was necessary. To this end, just three weeks later his own father, Zeno, assumed co-emperorship with him and the two ruled jointly until Leo's own death later in the year of an unidentified illness left Zeno to rule by himself. Due to the extremely short sole reign, there was hardly a chance for coins to come out in Leo's name alone. Yet there are a handful of such coins. This is likely due to their being issued in his name alone as well as jointly with Zeno while both were in power. RIC 801 Solidus Obv: DNLEOPERPETAVG - Diademed, helmeted three-quarter facing bust, holding spear over right shoulder and shield with left. Rev: SALVSREIPVBLICAE Exe: /CONOB - Leo II standing (with halo), facing, holding cross on globe. $23,203 5/21/05.